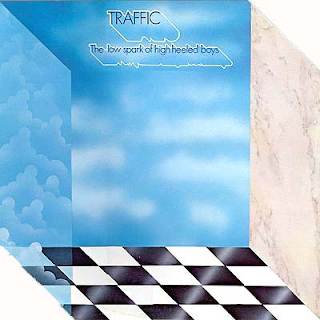 As with other 70s Traffic albums, “The Low Spark Of High Heeled Boys” featured different forms and offshoots of rock including jazz rock, progressive rock and often a melodious, funky bass line. Saxophone and piano abound, backing the now usual perplexing Pink Floyd influenced lyrics.The opening track, “Hidden Treasure” as with a fair few others, features some Jethro Tull-inspired flute amongst other flawlessly played instrumental passages. The sound quality on these recordings really is outstanding. The title track is an eleven minute tour de force, featuring some intoxicating saxophone, addictive bass lines, seductive congas and some piano breaks that surely influenced Bruce Hornsby nearly twenty years later. As with many of these extended Traffic songs, the lyrics are just incidental, rather like on some Santana tracks from the same period. Or indeed the jazz rock of Chicago or Blood, Sweat & Tears. They just waft in and out of the tracks, like an instrumental solo. 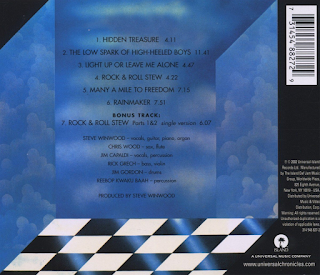 “Light Up Or Leave Me Alone” features some bluesy guitar breaks and a more blues rock/funk groove than the previous tracks. Again, Ric Grech’s bass is excellent, along with some stunning guitar at the end. “Rock n Roll Stew” is a slow burning, insistently rhythmic rocker with some potent drumming on it. It is probably the most conventional 70s “rock” number on the album, but even this has its bluesy moments. “Many A Mile To Freedom” is a laid back number with some excellent guitar parts either side of those vocal periods. “Rainmaker” sees the flute return in an ethereal opening that puts one in mind of Fairport Convention. All a bit folky/hippy, though, with lyrics about the rain “making all my crops grow” and the like. Once again, though, one can just concentrate on the fabulous guitar/saxophone fade out, which sounds just like one used by Paul Weller on his 1993 debut album. Someone said at the time that Traffic were “relaxed and exciting at the same time”, which would seem to be a perfrect way of describing their 70s output. You can listen to this over and over and still find new bits to appreciate.